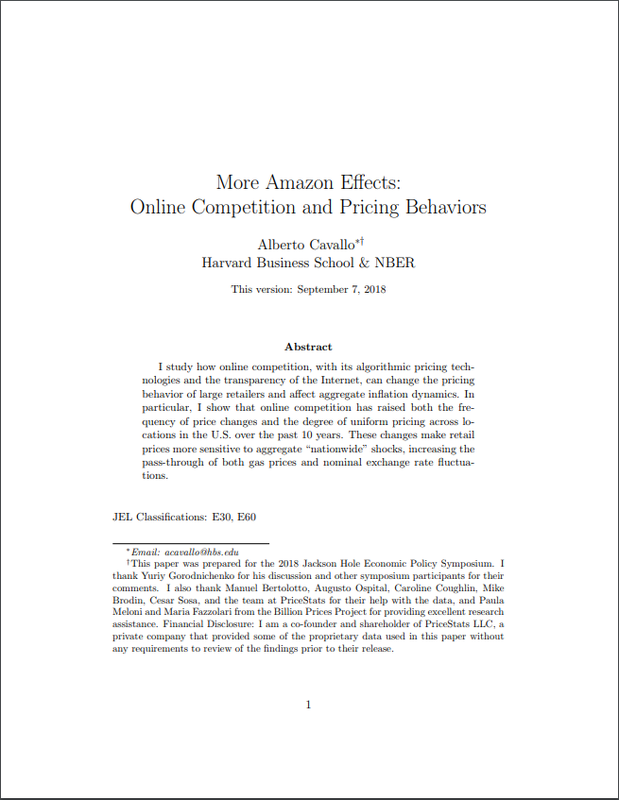 I study how online competition, with its algorithmic pricing technologies and the transparency of the Internet, can change the pricing behavior of large retailers and affect aggregate inflation dynamics. In particular, I show that online competition has raised both the frequency of price changes and the degree of uniform pricing across locations in the U.S. over the past 10 years. These changes make retail prices more sensitive to aggregate “nationwide” shocks, increasing the pass-through of both gas prices and nominal exchange rate fluctuations. We show that online prices can be used to construct quarterly purchasing power parities (PPPs) with a closely-matched set of goods and identical methodologies in a variety of developed and developing countries. Our results are close to those reported by the International Comparisons Program (ICP) in 2011 and the OECD in 2014, and can be used to obtain more up-to-date estimates of real consumption across countries without the need for consumer price index extrapolations. We discuss advantages and limitations associated with the use of online prices for PPs, including issues of representativeness and limited coverage of product categories and countries. Online prices are increasingly used for measurement and research applications, yet little is known about their relation to prices in physical stores, where most retail transactions occur. I conduct the first large-scale comparison of prices simultaneously collected from the websites and physical stores of 56 large multi-channel retailers in 10 countries. I find that price levels are identical about 72 percent of the time. Price changes are not synchronized but have similar frequencies and average sizes. These results have implications for national statistical offices, researchers using online data, and anyone interested in the effect of the Internet on retail prices. New data-gathering techniques, often referred to as “Big Data,” have the potential to improve statistics and empirical research in economics. 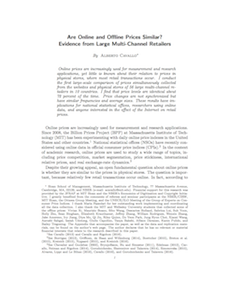 This paper presents one example of how this can be achieved by using the vast number of online prices displayed on the web. 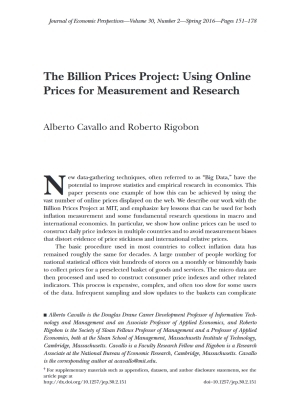 We describe our work with the Billion Prices Project at MIT, and emphasize key lessons that can be used for both inflation measurement and some fundamental research questions in macro and international economics. 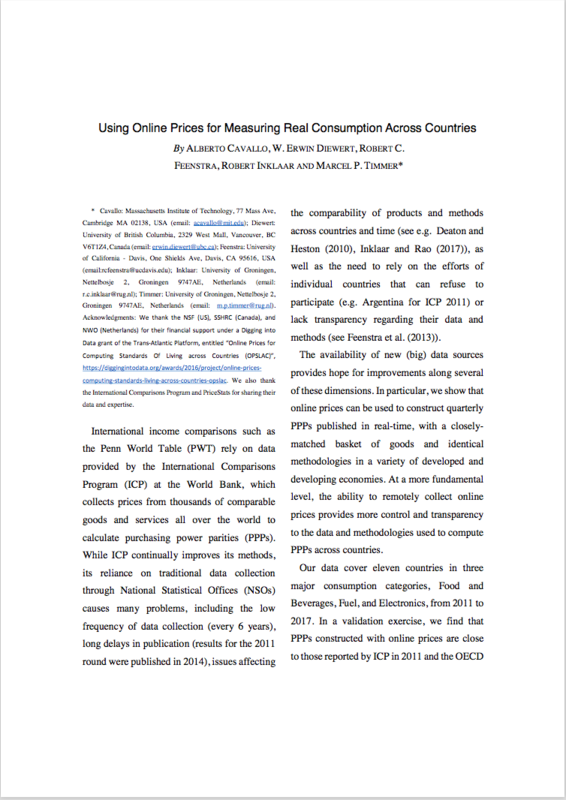 In particular, we show how online prices can be used to construct daily price indexes in multiple countries and to avoid measurement biases that distort evidence of price stickiness and international relative prices. Information frictions play a central role in the formation of household inflation expectations, but there is no consensus about their origins. We address this question with novel evidence from survey experiments. We document two main findings. First, individuals in lower-inflation contexts have significantly weaker priors about the inflation rate. This finding suggests that rational inattention may be an important source of information frictions. 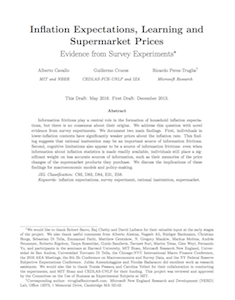 Second, cognitive limitations also appear to be a source of information frictions: even when information about inflation statistics is made readily available, individuals still place a significant weight on less accurate sources of information, such as their memories of the price changes of the supermarket products they purchase. We discuss the implications of these findings for macroeconomic models and policy-making. I use daily prices collected from online retailers in five countries to study the impact of measurement bias on three common price stickiness statistics. Relative to previous results, I find that online prices have longer durations, with fewer price changes close to zero, and hazard functions that initially increase over time. I show that time-averaging and imputed prices in scanner and CPI data can fully explain the differences with the literature. I then report summary statistics for the duration and size of price changes using scraped data collected from 181 retailers in 31 countries. We use a novel data set of online prices of identical goods sold by four large global retailers in dozens of countries to study good-level real exchange rates and their aggregated behavior. 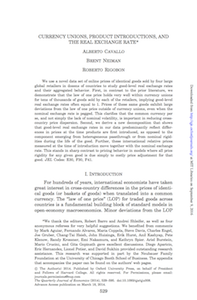 First, in contrast to the prior literature, we demonstrate that the law of one price holds very well within currency unions for tens of thousands of goods sold by each of the retailers, implying good-level real exchange rates often equal to 1. Prices of these same goods exhibit large deviations from the law of one price outside of currency unions, even when the nominal exchange rate is pegged. This clarifies that the common currency per se, and not simply the lack of nominal volatility, is important in reducing cross-country price dispersion. Second, we derive a new decomposition that shows that good-level real exchange rates in our data predominantly reflect differences in prices at the time products are first introduced, as opposed to the component emerging from heterogeneous passthrough or from nominal rigidities during the life of the good. Further, these international relative prices measured at the time of introduction move together with the nominal exchange rate. This stands in sharp contrast to pricing behavior in models where all price rigidity for any given good is due simply to costly price adjustment for that good. JEL Codes: E30, F30, F41. Prices collected from online retailers can be used to construct daily price indexes that complement official statistics. This paper studies their ability to match official inflation estimates in five Latin American countries, with a focus on Argentina, where official statistics have been heavily criticized in recent years. The data were collected between October 2007 and March 2011 from the largest supermarket in each country. 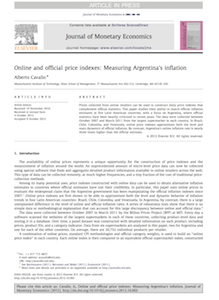 In Brazil, Chile, Colombia, and Venezuela, online price indexes approximate both the level and main dynamics of official inflation. By contrast, Argentina’s online inflation rate is nearly three times higher than the official estimate. 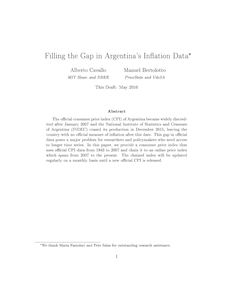 The official consumer price index (CPI) of Argentina became widely discredited after January 2007 and the National Institute of Statistics and Censuses of Argentina (INDEC) ceased its production in December 2015, leaving the country with no official measure of inflation after this date. This gap in official data poses a major problem for researchers and policymakers who need access to longer time series. 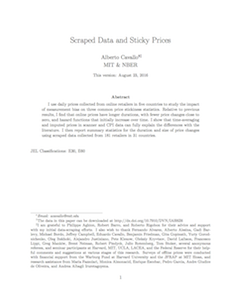 In this paper, we provide a consumer price index that uses official CPI data from 1943 to 2007 and chain it to an online price index which spans from 2007 to the present. The chained index will be updated regularly on a monthly basis until a new official CPI is released. Brookings Papers of Economic Activity, Spring 2016. When forming expectations, households may be influenced by perceived bias in the information they receive. 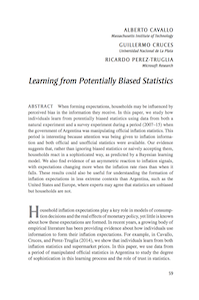 In this paper, we study how individuals learn from potentially biased statistics using data from both a natural experiment and a survey experiment during a period (2007–15) when the government of Argentina was manipulating official inflation statistics. This period is interesting because attention was being given to inflation information and both official and unofficial statistics were available. Our evidence suggests that, rather than ignoring biased statistics or naively accepting them, households react in a sophisticated way, as predicted by a Bayesian learning model. We also find evidence of an asymmetric reaction to inflation signals, with expectations changing more when the inflation rate rises than when it falls. These results could also be useful for understanding the formation of inflation expectations in less extreme contexts than Argentina, such as the United States and Europe, where experts may agree that statistics are unbiased but households are not. 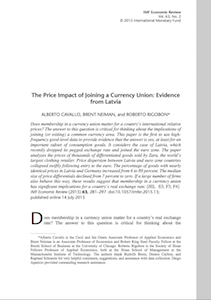 Does membership in a currency union matter for a country’s international relative prices? The answer to this question is critical for thinking about the implications of joining (or exiting) a common currency area. This paper is the first to use high-frequency good-level data to provide evidence that the answer is yes, at least for an important subset of consumption goods. It considers the case of Latvia, which recently dropped its pegged exchange rate and joined the euro zone. The paper analyzes the prices of thousands of differentiated goods sold by Zara, the world’s largest clothing retailer. Price dispersion between Latvia and euro zone countries collapsed swiftly following entry to the euro. The percentage of goods with nearly identical prices in Latvia and Germany increased from 6 to 89 percent. The median size of price differentials declined from 7 percent to zero. If a large number of firms also behave this way, these results suggest that membership in a currency union has significant implications for a country’s real exchange rate. 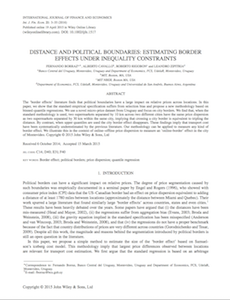 The ‘border effects’ literature finds that political boundaries have a large impact on relative prices across locations. In this paper, we show that the standard empirical specification suffers from selection bias and propose a new methodology based on binned-quantile regressions. We use a novel micro-price dataset from Uruguay and focus on city borders. We find that, when the standard methodology is used, two supermarkets separated by 10 km across two different cities have the same price dispersion as two supermarkets separated by 30 km within the same city, implying that crossing a city border is equivalent to tripling the distance. By contrast, when upper quantiles are used the city border effect disappears. These findings imply that transport cost have been systematically underestimated by the previous literature. Our methodology can be applied to measure any kind of border effect. We illustrate this in the context of online–offline price dispersion to measure an ‘online-border’ effect in the city of Montevideo. 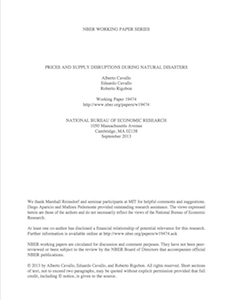 We study the daily behavior of supermarket prices and product availability following two recent natural disasters: the 2010 earthquake in Chile and the 2011 earthquake in Japan. In both cases there was an immediate and persistent effect on product availability. The number of goods available for sale fell 32% in Chile and 17% in Japan from the day of the disaster to its lowest point, which occurred 61 and 18 days after the earthquakes, respectively. Product availability recovered slowly, and a significant share of goods remained out of stock after six months. By contrast, prices were stable for months, even for goods that were experiencing severe shortages. These trends are present at all levels of aggregation, but there is heterogeneity across categories. We further look at the frequency and magnitudes of price changes in both countries and find that the results in Chile are consistent with pricing models where retailers have fear of "customer anger". In Japan the evidence suggests a bigger role for supply disruptions that restricted the ability of retailers to re-stock goods after the earthquake. 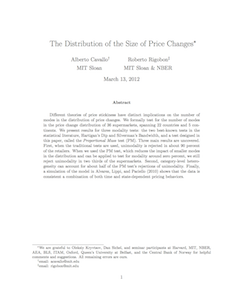 Different theories of price stickiness have distinct implications on the number of modes in the distribution of price changes. We formally test for the number of modes in the price change distribution of 36 supermarkets, spanning 22 countries and 5 continents. We present results for three modality tests: the two best-known tests in the statistical literature, Hartigan’s Dip and Silverman’s Bandwidth, and a test designed in this paper, called the Proportional Mass test (PM). Three main results are uncovered. First, when the traditional tests are used, unimodality is rejected in about 90 percent of the retailers. When we used the PM test, which reduces the impact of smaller modes in the distribution and can be applied to test for modality around zero percent, we still reject unimodality in two thirds of the supermarkets. Second, category-level heterogeneity can account for about half of the PM test’s rejections of unimodality. Finally, a simulation of the model in Alvarez, Lippi, and Paciello (2010) shows that the data is consistent a combination of both time and state-dependent pricing behaviors.